Absolutely lovely! It reminds me of this thing they used to do shortly after the french revolution called a bal aux victimes. you had to be a relative of someone who was executed during the revolution to attend, and they’d wear low cut dresses with their hair up and ribbons around their necks to mimic the victims on the way to the guillotine. 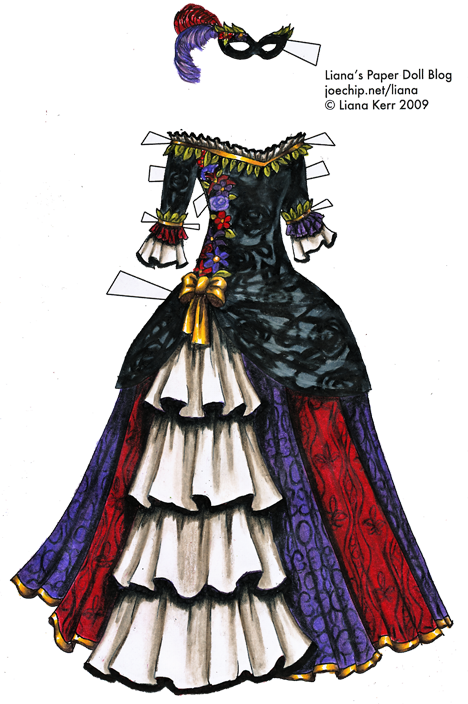 that’s a grisly memory for such a pretty dress! sorry! Some Like It Hot is my favorite movie. And this dress turned out really amazing! This is AMAZING! One of the best ones in a while!!! Love it! This is FANTASTIC! So dramatic and stunning. Beautiful. Am absolutely in love with this. It’s wonderfully opulent and utterly stunning. Am only not sure my printer can handle it. Very beautiful! Thank you. Now, I wish I had one in my size, and a masquerade to wear it to! hey! ummm my b-day is in JULY can you draw me a b-day dress?! :) ???? It’s more of a fantasy gown than one based on any particular time period. I suppose that when I think of masquerade gowns I think of elements from the 1700s, but that is my own preference more than anything based in historical fact.